At DBS, we solve this problem with MillCreek basement flooring, which provides the beauty of real wood without the risks of water damage and mold. To learn more about what this product can do for you, call us at 1-855-259-9625 or click below. We offer free estimates in Duluth, Superior, Minneapolis and the nearby areas! If you want hardwood flooring for your basement, choose Millcreek Flooring™ from DBS. Our quality faux hardwood floor will give you a beautiful finished appearance without the risk of water damage and mold. Call us today at 1-855-259-9625 to get started with a free estimate on basement floor installation! 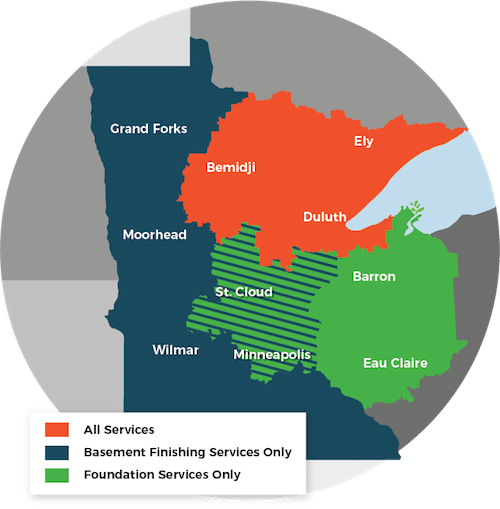 We proudly serve in Superior, Duluth, Minneapolis, Two Harbors, Cloquet, St. Paul, Hermantown, Virginia, Ashland, Esko and throughout the surrounding areas in Minnesota and Wisconsin.